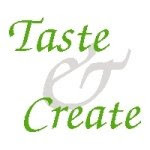 *Taste & Create is an amazing monthly food blog event, created by my friend Nicole of For the Love of Food. Participants are paired up randomly, and each create a recipe from their partner's blog! It is so fun! Please join us. The deadline to sign up is the 8th day of each month, email me at cowgirlmin07[at]gmail[dot]com if you're interested! My partner this time was Vicky from Avocado Pesto. I'm sorry to say this recipe is embarrassingly late, but better late than never, I suppose. So initially I was intrigued by these pork/dough things on Vicky's blog, called Cha Sui Bao, don't they look fabulous, and Vicky even emailed me the recipe! I decided I didn't have the ambition, let alone the ingredients, to prepare that dish now. But I WILL. Some day. After some more searching, I decided to make Vicky's Almond Macaroons. And then that just didn't happen. Am I glad that I didn't settle for making some cookies with which Vicky herself wasn't thrilled. I was searching again, in desperation now, when I found it. A recipe that sounded so delicious, I just had to make it that night. It is called Shrimp Laksa, and it is heavenly. A fairly simple Malaysian shrimp soup, with coconut milk and curry paste and a dollop of peanut butter, shrimp and lightly crunchy fresh vegetables. It was so good. I will definitely be making it again! I do have two young boys, and although one of them eats Cholula sauce by the spoonful, he doesn't like his regular food to be spicy, so I modified a bit. Also couldn't find lemongrass (no surprise) in my teeny tiny grocery. But hey, we even had a box of rice noodles in the pantry! It was destined. You'll find my modifications below in parenthesis. Follow the link to check out more of Vicky's creations! So the verdict from the boys: the 8-year-old loved it, the almost-6-year-old did not. We also loved it, so the 6 year old is out of luck, I'm making it again!! a very bad, poorly lit iPod photo, but here it is served up with the noodles! 2. Add the coconut milk, red curry paste and peanut butter to pan, whisking until smooth. 3. Add the fish sauce, chicken stock, ginger, shrimp, sugar snap peas and red pepper. Cook until shrimp is pink and vegetables have cooked a little but are still crunchy. 4. Add lime juice, green onions and cilantro. 5. Serve with vermicelli noodles and add sriracha to taste.